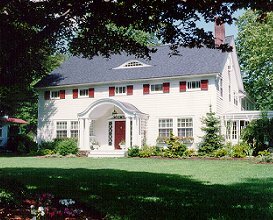 The Warwick Valley Bed and Breakfast is a completely restored 1900 Colonial Revival home boasting with charm, grace and architectural splendor of an era past, but not forgotten. Set in the historic district offering hospitality at its finest! 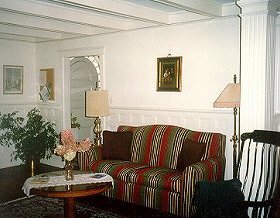 Each prestine, centrally air conditioned and smoke free room is tastefully decorated with an eclectic combination of antiques and country furnishings. Queen, twin and king bedded rooms $120 - $145 (Visa, MC, Amex, Disc). Each guest room has: DSL, a telephone with separate phone line, a desk or work table, TV/VCR. In addition, provided on site is a fax machine and a photocopier. Business traveler's should start or end their day here! Not only are business needs met, but each guest rooms provides the best in comfort with high quality bedding and towels, not to mention the decor! Come, enjoy the high quality of cleanliness, decor and landscaping that is pleasing to the eye and comforting to the soul! Other Amenities: Covered porch with Adironack chairs, relax, read a book or take a nap. Crackling fireplace warms the guest living room in the cold months or simply plan your next day's events. Use of kitchen and laundry facilities available for longer stays. Cordless guest telephone for privacy. We invite you to discover the wonders of the Hudson Valley from our historic inn! This and other Warwick Bed and Breakfast Inns can be found here in The Register.